The Moto Pulse doesn't sacrifice much to meet its low price point. Listeners with a knack for high-fidelity audio won't dig the muffled soundstage, but Moto puts forward a nearly irresistible deal for everyone else. As convenient as cutting the cord and going with wireless headphones can be, it's difficult to ignore their usual high asking price. Sometimes, they can go for $50 or $100 more than a set of wired ones with similar sound performance. Not the Moto Pulse. I would say that Motorola, the company behind some of the most well-known phones, is merely dipping its toes in the headphone market with the Pulse. 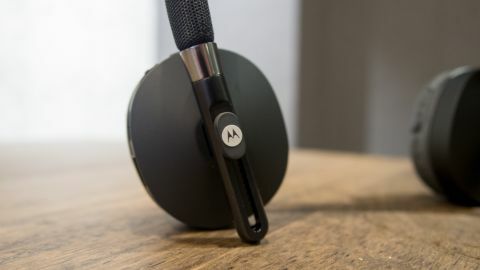 But for $59 (about £37, AU$80 but not currently available outside the US,) Motorola is cannon-balling with these Bluetooth headphones, which are stocked with features, offer full sound quality and stellar battery life. I expected it to be an easy task to point out all the spots on the Pulse where Moto opted for cheap build materials or boring design to cut down costs. I can find a few, but not nearly as many as I thought. The on-ear makeup of the Moto Pulse is 80% headband, 20% ear cups. It's skull-spanning headband is flexible and coated all around with a breathable, mesh fabric. The band is very wide-set, so most head sizes should fit comfortably inside. Reaching down to its sides, the Pulse's headband slims down and transitions into a ring of metallic-painted plastic. Each side is labeled with the correct ear orientation. But, so long as you can memorize the various, somewhat confusing button functions, it doesn't make much of a difference which side goes on which ear. The ear cups are attached to a sliding mechanism that gives them some wiggle and sizing flexibility. Finding a good fit is fairly simple, though I occasionally find that the Pulse wants to wiggle out of the size I set it to. Sort of annoying, but it doesn't ruin my experience. The padding on the ear cups is totally sufficient for hours-long listening sessions, and the leatherette coating helps your ears to stay cool. All of the Pulse's controls are located around the right ear cup. The microUSB port and built-in microphone are placed on its bottom side, while four buttons wrap around its side. From bottom to top, the first button operates play and pause. Its second and third buttons are a volume rocker, which can change songs with a press held for over one second. The last button is a power button that can also be pushed down to pair to new devices. It's a bit tough to feel where the buttons begin and end, but this learning curve is fairly easy to conquer. There isn't much else inside the box aside from a microUSB for charging. I always love seeing a tote included, but I can understand its omission for the low price of the Pulse. After all, the Pulse's ear cups swivel flat, so they can fit in practically any bag you're already using. For $59, you can only ask for so much. But Motorola stretches the listener's dollar further than it usually goes in the portable audio market. Despite some minor issues, the Pulse's design is a win. And when it comes to sound performance, Moto proves again that you shouldn't judge tiny cans before you try them. The sound quality isn't up there –or anywhere close– to headphones crafted specifically to deliver a masterclass experience, like the Sennheiser Momentum Wireless. But, again, for the low asking price, it's hard to complain. The bass, while not the most accurate, has enough boom to lay your tracks down with a decent amount of "oomph." The Pulse offers a generally full sound, but picked apart, the mids and highs are entangled in each other. The end result is a sound profile lacking sheen and richness. But it could totally work for you. Everyone's ears are different. On the functionality front, the Moto Pulse continue to impress. It's impressive advertised battery life of 18 hours held true during my testing. I began using these the day they were announced and took note around the 16th hour that battery life still hovered around low-medium. They finally zapped out at around 19 hours of non-continuous use at various volume levels. Phone call quality is just fine, as is the microphone's ability to pick up my voice. The Moto Pulse offer universal support, meaning that they can work with Android, as well as iOS and any tablets packed with Bluetooth capabilities. Additionally, their range reaches an impressive 60 feet, which is a larger distance than I usually stand from my phone. These signal from these cans operates distortion-free in my 35-foot long apartment through several walls. The Moto Pulse are on a mission to include the most value possible into a set of on-ear headphones. And Moto triumphs by including Bluetooth, stellar battery life and universal controls in this $59 (about £37, AU$80) package. The sound performance (save for the pulpy bass) doesn't measure up to what you'll find in the $59 Skullcandy Grind. However, on the whole, these are an easy recommendation if you're looking for a budgeted set of Bluetooth headphones that doesn't skimp out on features.